Back in 2008 methane Light Towers first appeared and were named by the Zetas. Everyone else was at a loss to explain them. ZetaTalk Description 1/24/2008: Where a slow explosion has passed, the smoke created can linger, looking like a dark tornado floating in the air. Where the slow explosion occurs at night, the light can seem dramatic for the few minutes it lasts. More effects from the tail of Planet X can be anticipated as the tail components increase in density in the atmosphere of Earth. By August, 2015 these Light Towers were so pronounced that they looked like floodlights beaming up toward the heavens. 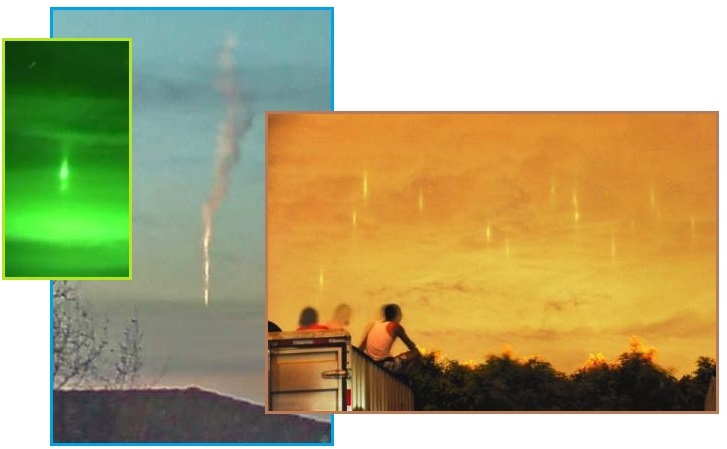 ZetaTalk Comment 8/22/2015: Light towers were noted in 2008 by soldiers in Iraq, who sighted these burning methane spires while wearing night vision goggles. Photos of twirling smoke drifting upward during the day in Canada showed that these towers were occurring during the day, also. Recently in Escanaba, Michigan a transformer exploded during a lightning storm, lighting a methane spire that had been released during an earthquake. And in late 2014 a methane flash in the Urals turned a highway into day for a few moments, in front of astonished commuters. The recent methane tower captures are close at hand, in low lying clouds, so the lit methane is under pressure and blowing out of the ground where seen, thus the tube appearance. 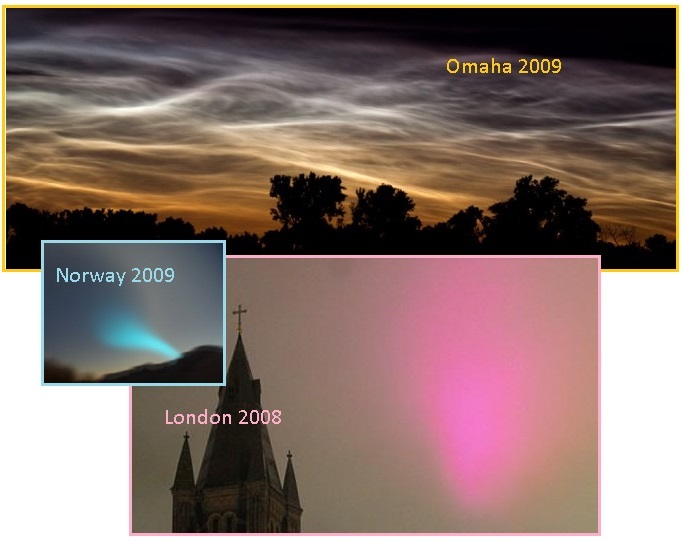 Other signs in the skies have been the magnetic spirals, starting with the dramatic Norway Spiral in 2009 which included the magnetic spiral, a neon cloud, and a grounding of the charge to the Earth. Where methane Light Towers are caused by the release of trapped methane from rock during plate movements, the magnetic spirals and neon clouds are caused by the vast wafting tail of Nibiru, aka Planet X. Neon clouds glow, in various colors, due to a chemical reaction, just as man’s chemical light sticks do. The tail of Nibiru is greasy, as the Zetas explained at the start of the ZetaTalk saga. This oily substance was collected from the planets formerly in the Asteroid Belt, which were pummeled to pieces by prior passages through the Solar System by Nibiru. They had life, and thus petrol elements which come from rotting vegetation and dead creatures. These elements do not burn off in space, as they lack oxygen for the burn. But when the tail wafts the Earth, during passages, the oil has in the past drained down through cracks in the ground into underground reservoirs of oil. ZetaTalk Description 10/15/1995: Oil and gas do not form under normal circumstances, they form under extraordinary circumstances, and for the Earth most often these circumstances are presented during a pole shift, where forests do get sandwiched between layers of rock and lava floods over broad areas. Petrol-chemicals that form in the sky, where they fail to burn due to lack of free oxygen, soak into the fractured ground and become trapped during the settling process that afterquakes provide for many years after a pole shift. 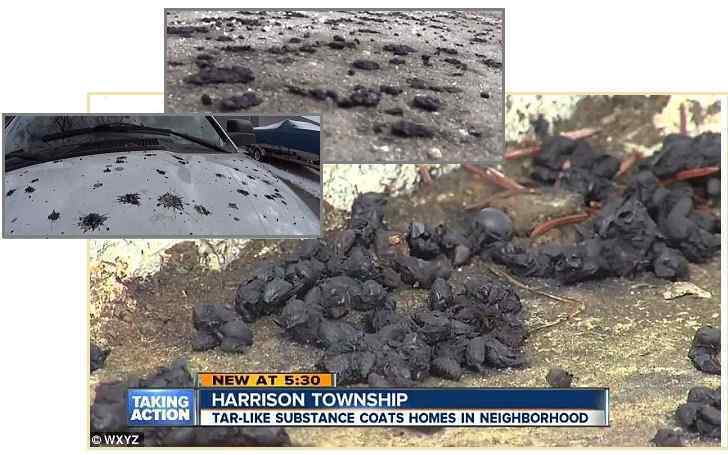 Now we have yet another sky phenomena – chunks of what looks like tar falling from the sky north of Detroit, Michigan. This is not tar, however, as it is not flammable. The establishment was at a loss to explain this phenomena, which has never happened before, though the Zetas predict they will soon concoct some excuse. Per the Zeta, these chunks are akin to ash, the after effects of combustion of greasy elements in the tail of Nibiru. These elements burned, leaving what cannot burn – ash – to fall from the sky. If the term Light Towers could be attributed to the Zetas, the term Blanket Fire is yet another such term. 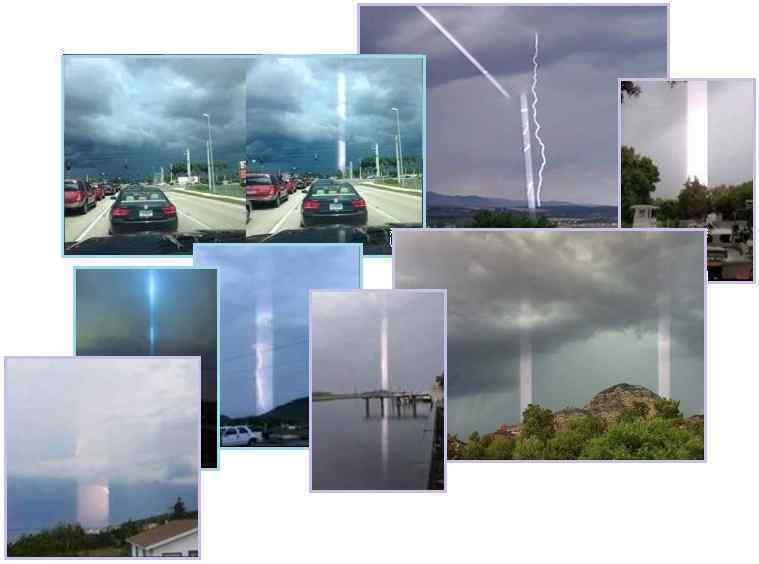 We will be seeing more of this, per the Zetas, and if it occurs at night, it will certainly be visible and astonishing. The black, oily substance first appeared on at least six driveways in Harrison Township, what the material is still remains a mystery. Residents originally believed that the substance could have come from the nearby Selfridge Air National Guard Base, but the base released a statement saying it was not coming from their location. It does not appear to be a fuel substance at all and so we did confirm that but it appears as though it came from an aircraft but we haven't confirmed that. ZetaTalk Explanation 2/27/2016: This tar-like substance is akin to ash, from petro elements in the tail of Planet X, aka Nibiru, burning in the atmosphere above Harrison Township (near Detroit). It is not flammable anymore, as it is, like ash, those portions of the burn that are not combustible. The establishment will come up with some plausible excuse, as usual, but that this scenario has never happened before, in human memory, is a clue that their excuses will fail, at least in the minds of the public. Nibiru has drawn closer, as the many naked eye sightings and Second Sun sightings confirm. The tail is pointed toward the Earth during this approach, and thus the greasy elements in the tail wafting Earth are more dense. In parts of the world where rock stress and methane release are intense, as is occurring along the Seaway which is tearing apart, there will be the foundation of sky fires. Beyond the incidence of Light Towers which have been in evidence since 2008, methane alit, there will be blanket fires, where the methane and greasy elements in the tail are afire laterally in the skies. The end result of this is of course ash, puzzling those below who missed the blanket fire, which would only be visible during the night. These incidents will be on the increase. 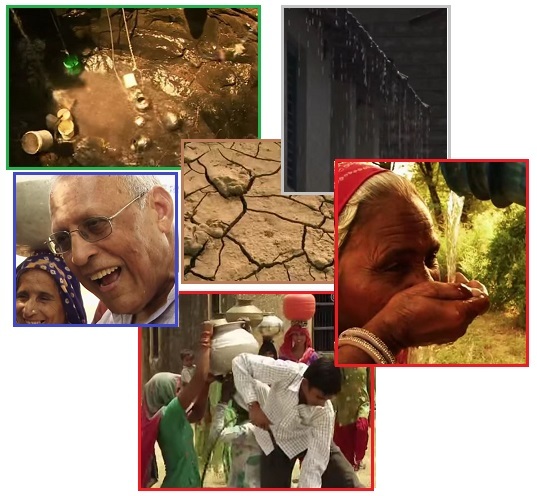 In the matter of hygiene, and health, soap and water are considered basic necessities. How do those countries, those regions, where neither are really available suffer? They suffer with water born infections, and infections that could be prevented by washing hands. 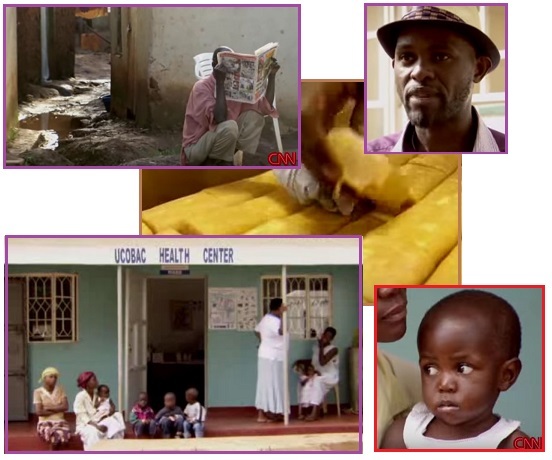 These CNN heroes show that solutions do not require a lot of cash, in fact only require a little effort. The solutions are not rocket science either! Digging a well. Collecting rain water on a roof for use during the dry season. Collecting barely used soap bars to be recycled. Basic necessities, practical solutions, put into action by those with big hearts. Doc Hendley, bringing safe water to the Sudan, Ethiopia, Uganda, India, Camboia, and Peru by digging wells for the poor. He is hands on in his efforts. A bartender from N Carolina, he started the Wine to Water campaign to raise funds. Doc says he feared “My efforts are going to be a drop in the bucket. But if I had never taken that step because it was too big a problem, we wouldn’t be anywhere right now.” Doc stresses that more children are killed by lack of clean water than HIV, Malaria, and Tuberculosis combined. And remember, for that day when the soap runs out, you can make your own! Like the pioneers did. Simply collect water drained through ash, and boil this with grease or oil. And then we'd carry th' water - nobody ever had running water in those days - we'd carry th' water and throw over th' ashes and drip th' lye. Then we'd put th' grease and lye in a pot and boil it down 'til it got hard; and then we'd use that for soap. N Korea is starving, though those close to Kim are well fed. The people are ruthlessly suppressed, the media not allowed to reveal anything that would tell the truth. There are reports that in N Korea, the dead are not buried until they start to rot, else they are dug up by the starving and eaten. From children working hard in the fields to a group of soldiers pushing a broken-down bus, these are the photographs that North Korean leader, Kim Jong Un, didn't want you to see. North Koreans have to eat grass. How to remove a ruthless egocentric dictator from power? The world has been struggling with N Korea’s Kim for years, as with his father before him for decades. Lately things have only gotten worse. Nuclear bragado, threats if food and other bounty are not provided to the N Korean regime, and meanwhile Kim the younger is murdering those around him faster than they can be promoted to his inner circle. He reportedly murdered one military chief by anti-aircraft missile, by using him as a target at a training facility. This maneuver, viewed by hundreds, was to instill fear. Despite this brutal demonstration, the assassinations of those close to him continues at a furious pace, with a reported 50 deaths in 2015 alone. This type of brutality is not unknown in mankind’s history. 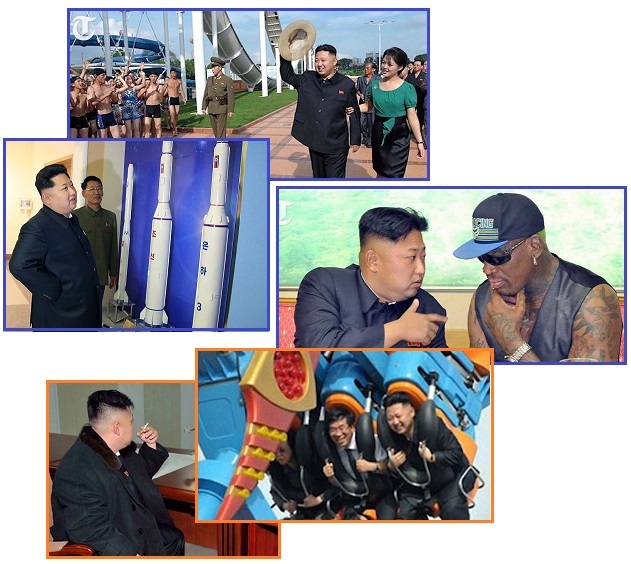 Meanwhile, the picture presented to the world is one of Kim being fun loving, well fed, and a prosperous N Korea. Top army general Pyon In Son, often seen alongside North Korean leader Kim Jong Un in his public appearances, was reportedly executed over a disagreement. Kim has a history of purging top military officers since he took power, but his decision to terminate Pyon is seen as a sign that even his close aides are not immune to consequences should they disagree with the leader. The North Korean leader has long been mistrustful of the military, removing Ma Won Chun, a National Defense Commission official, from office in November and executing his uncle Jang Sung Taek, vice chairman of the defense commission, in 2013. Since Kim took power from his deceased father in 2011, some 50 officials were executed last year alone on charges ranging from corruption to watching South Korean soap operas. North Korean state media confirms new military chief, following reports that previous army head was executed. Ri Yong-Gil was reportedly executed early this month in what would be the latest in a series of purges and executions of top officials. Ri Yong-Gil was accused of forming a political faction and corruption. North Korea has executed the head of its military on charges of treason. The sentence was carried out on Hyon Yong-chol at a military training facility on April 30 with the firing squad using anti-aircraft weapons. ZetaTalk Insight 2/27/2016: Mankind has many recent examples of dictators with ruthless control, and what they can do to their populace. Stalin is estimated to have killed tens of millions of his own citizens through various purges aimed at maintaining his control for 30 years. He died a natural death, still in control. Idi Amin in Uganda had a shorter reign and ruled by mass murder, reportedly eating body parts of his enemies, before escaping to exile in Saudi Arabia. Montezuma of the Aztecs exacted tribute by ripping the hearts of out of human sacrifices, but this royal family was only toppled when the Spanish conquistadors arrived. 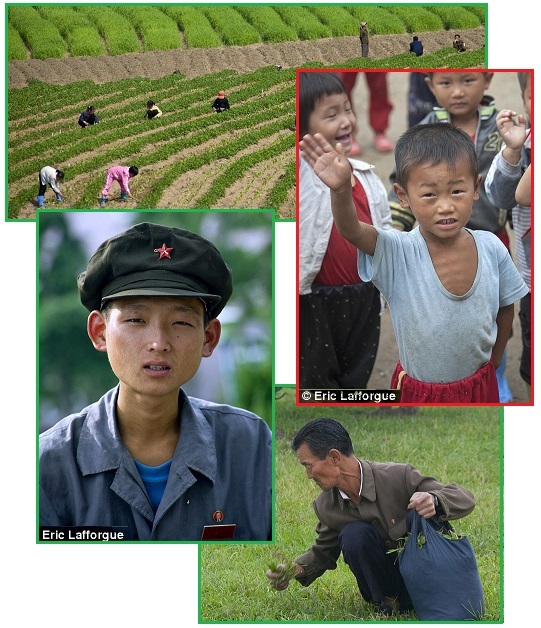 China stepped in to broker cooperation with Kim, providing food and trade with N Korea to secure this cooperation. But this did not last. Suddenly, there are military exercises whereby the US and S Korea seem to be preparing for an invasion of N Korea. Suddenly, China has frozen N Korean funds. What’s going on? Is an invasion of N Korea about to happen? Or is Kim’s administration being squeezed? The Zetas explain. More than 90,000 South Koreans and 15,000 US troops will stage a “pre-emptive strike” on simulated North Korean weapons silos, following Pyongyang’s rocket launch and a nuclear test earlier this year. The Obama administration initiated a clandestine diplomatic effort to engage North Korea on ending tensions on the Peninsula—only to be rebuffed by the Communist regime days before it launched another nuclear test. The U.S. called off nascent talks with North Korea aimed at formally ending the Korean War when it became clear that the reclusive nation wasn’t interested in stopping its nuclear program by conducting a ballistic missile test. The talks, which Pyongyang requested, ended after North Korea rebuffed a U.S. demand that denuclearization be a condition for the negotiations. The U.S. and North Korea reached an agreement in 2005 with other nations including Japan and South Korea that set the groundwork for future talks premised on denuclearization. In a process which actually began in December, China took the nearly unprecedented step of having their banks freeze the assets of North Korean depositors and halt all cash transfers to Kim Jong-un’s realm. China also has the only real leverage over the North Koreans. China really holds the leash is their economic ties to the regime. 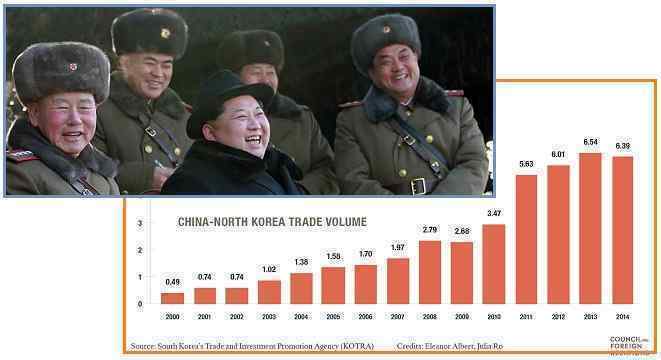 China accounts for nearly all of North Korea’s trade and support. It’s unclear if even that would deter Kim’s ambitions. Their people are already starving to death in large numbers, with millions more rotting away in prison camps. Until the sanctions and hard times begin to hit the leadership in Pyongyang personally the madman may simply stick to his guns. ZetaTalk Insight 2/27/2016: Dictatorships are not, in short, toppled because the people are oppressed and starving, tortured and misused, however resentful they may be. Clever dictators reward those in the palace around them, and have periodic purges of those they suspect may be planning to overthrow the dictator, thus lessening the likelihood of a coup. They can survive until there is nothing left of their country. This is where N Korea would go except for the nuclear threat. China and the US are making a concerted push now to depose Kim. By both withholding the economic support that China has provided and holding military exercises that imply a pending invasion of N Korea, they hope to cause the paranoid Kim to attack those around him so viscously that they depose him, murder him.